The 2018 winner of the ACTIAM investment expert poll is Frank Bonsee sales trader at ABNAMRO. In honor of this he sounds the gong at the Amsterdam stock exchange. 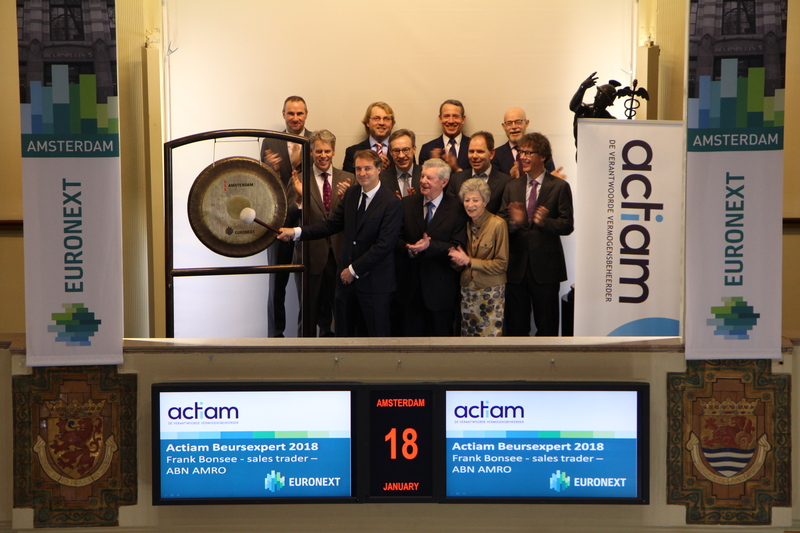 Every year assetmanager ACTIAM asks over a hundred investment professionals for their expectations for the best and the worst stock in the coming year. Besides that, the participants are asked for their expectations for the AEX-index. This poll has been conducted since 1994. The investment professional who made the best choices is the winner and receives the price for best investment professional. 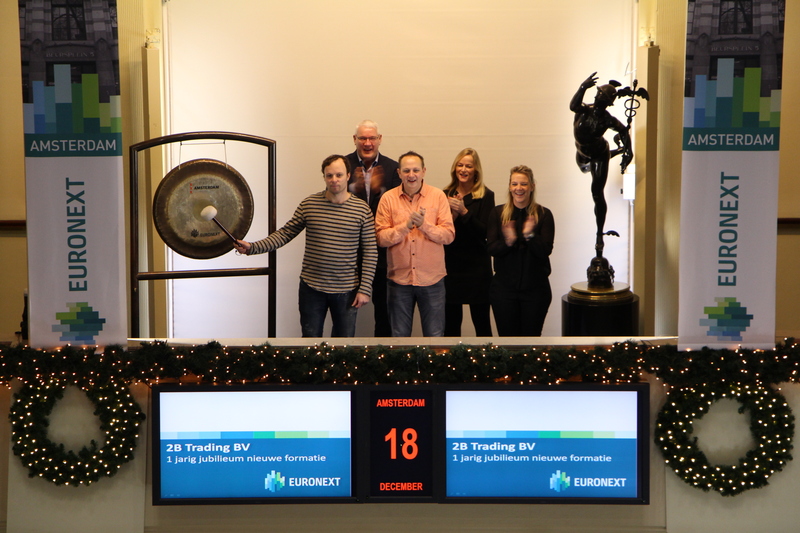 Bauke van der Sluis and Mees van de Wetering, winners of the Bert Douwes Award 2018, sound the gong to open the trading day at Beursplein 5. The two students of the Hogeschool van Amsterdam Minor Beleggen have been selected from a number of nominees as authors of the best paper in 2018. Within the minor, which lasts for six months, students have to write a paper about a current investment topic. The winning paper dealt with the influence and use of Big Data in the financial world, and in particular the investment market. 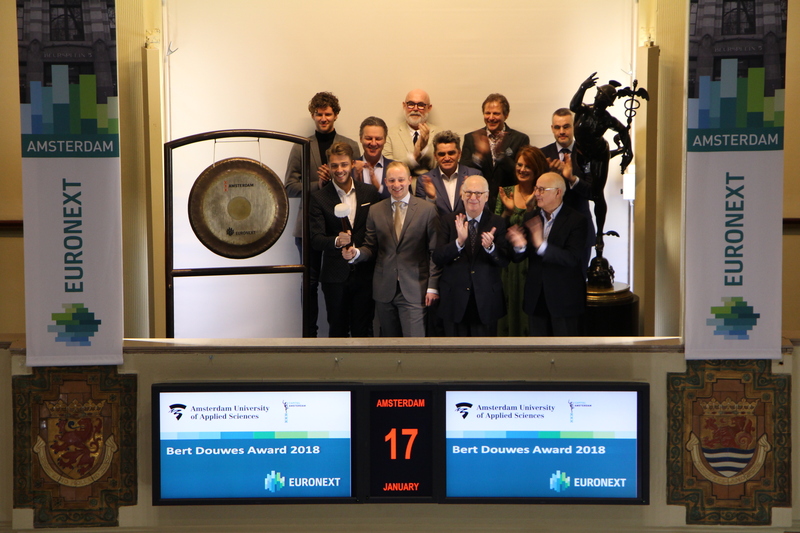 The award (the Bert Douwes Award) is named after a teacher of the minor, Bert Douwes, who died in 2007 and is awarded annually by a jury consisting of Ton Ruitenburg (former Euronext), Eelco Hessling (ex Euronext and lecturer of Investment Ethics at the HvA ) and Theo Feijen (former option trader and lecturer in behavioral analysis at the AUAS) and consists of a sculpture and € 1500, - which is made available annually by the Capital Amsterdam Foundation. Gong in the run up to the "Hotelnacht Amsterdam 2019"
19 & 20 January , Hotelnight Amsterdam will be held for the seventh time. Initiator Vincent van Dijk has the honor to sound the gong. During the Hotel Night several hotels in Amsterdam open their doors for their fellow citizens. Throughout the weekend, around 50 culinary, creative and cultural events are organized in more than 30 top hotels. On the 17th of Janurary 2019 ‘Nationale Vereniging de Zonnebloem’ turns 70 years old. The NGO enriches the life of people with a physical disability. 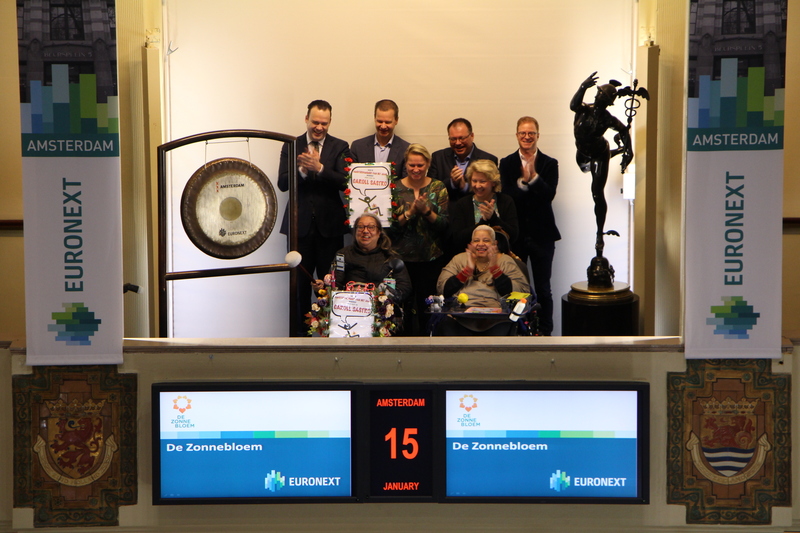 Caroll Sastro, who uses a wheelchair for everyday life, opens the stock exchange to celebrate this anniversary. 38,000 volunteers are active in every neighborhood, village and city in the Netherlands. They visit people at home. Most people with a physical disability cannot leave their homes as much as they want. Due to lack of personal help and/or because of medical care they need. That is why 1,100 local Zonnebloem branches organise activities, such as day trips and holidays. Annually over 112,000 people participate in those activities. The NGO improves the accessibility of the most visited leisure locations in the Netherlands. Therefore 750 wheelchair users act as mystery guests and test theme parks, cinemas, zoo’s, theaters, football stadiums, and so on. Also, de Zonnebloem has a fleet of 50 wheelchair rental cars, across the Netherlands. The market is opened by Futurity Psychologist Tom Kniesmeijer, in his function as initiator of the Trendrede (‘Trend-discourse’). Together with a selected group of trendanalysts, he bundles the larger developments in society in the yearly Trendrede. Tuesday, January 15th, the ninth Trendrede will be presented in Amsterdam. After that, the Trendrede will start its journey through media, organizations and Holland. This year the theme is The fire of change. Things are heating up in The Netherlands. The need for change is great. How will this work out, in 2019? What will be the big change missions in our society? What will be the trendtopics to dominate public discussion, the coming year? The Trendrede is loved by policy makers of both goverment and market companies. The first version originated in 2010 and since then every year saw the birth of a new one. The Trendrede focuses on the larger trendwaves in society, to help organizations with planning future proof strategies. The winners of the Dutch IR Awards 2019 pay a visit to Beursplein 5 to sound the gong. 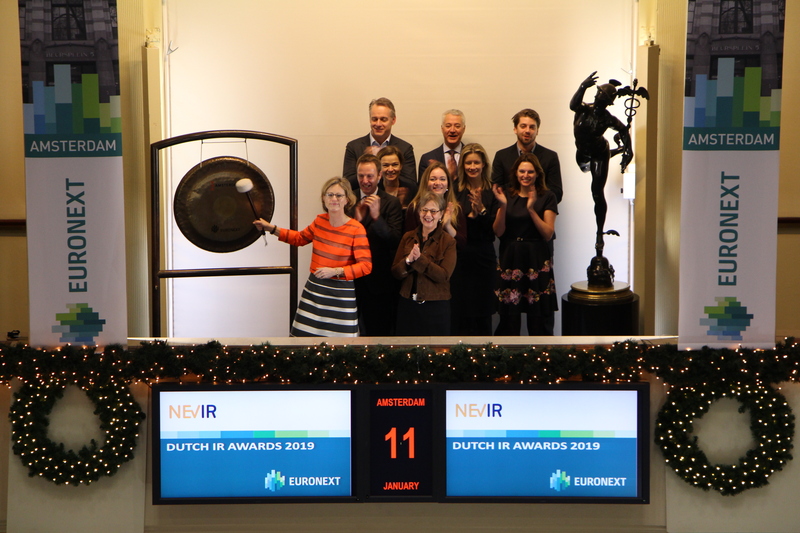 The Netherlands Association for Investor Relations (NEVIR) awarded the Dutch IR Awards 2019 on the 10th of January. For the twelfth consecutive year, prizes will be awarded to Dutch listed companies and IR professionals who excel in Investor Relations. NEVIR is the professional representative body and advocacy organization for investor relations officers at Dutch listed companies. 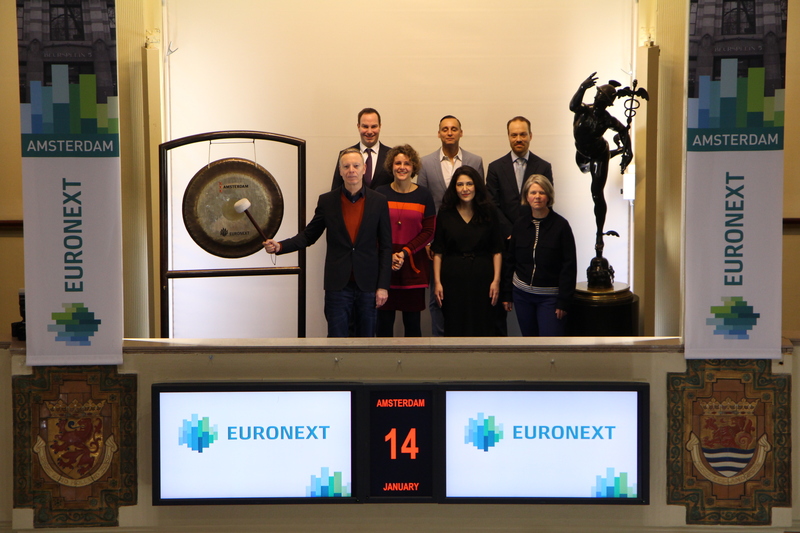 More than 70% of the listed companies at Euronext Amsterdam are a member of the NEVIR. Nyenburgh is active worldwide in the most important financial markets, mainly with proprietary trading, arbitrage trading and long-term investments in Life Science companies. In addition, the company offers professional traders the opportunity to rent a workplace on the former trading floor of the Amsterdam Exchange, or from any location in the Netherlands. 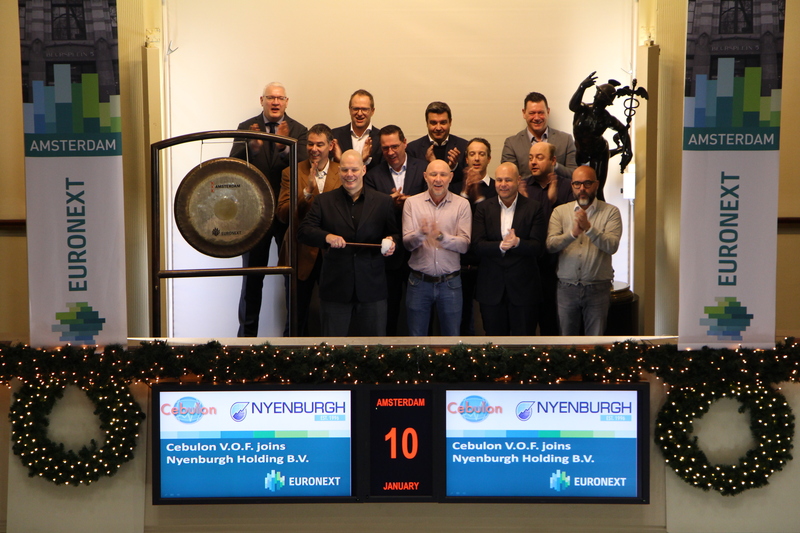 Nyenburgh has gained a unique position within the professional trade community in the Netherlands through its professional trading facilities, unique partnership structure and competitive rates. Benoît Grenot, CEO of Baikowski, opens the trading day in Paris. Baikowski specializes in the manufacture of inorganic chemicals and fine minerals for the high-tech industrial markets. The group offers high purity alumina powders, fine oxides and composites such as spinel, ZTA, YAG, cerium for applications in lighting (low-intensity lamps and lamp tubes), watchmaking (sapphire tops and ceramic parts), electronics (semiconductors), medical (prostheses and intraocular implants) and other industries. Baikowski has 3 production sites located in France, the United States and Japan. Insurance company a.s.r. ended as runner up in the battle for the HR Proffie 2018, the award for the best HR strategy in The Netherlands. To celebrate this Jolanda Sappelli, director of Human Resouces at a.s.r., rings the bell. Since 2004, the HR Proffie is awarded by a professional jury that is composed of well-respected Dutch HR professionals. This year, the competition was built around the theme ‘Workforce of the Future’ and the jury was looking for companies that use significant HR strategies and HR tools to anticipate on the changing labour market. Participants were judged on their best practices and specific examples that bring the HR profession to a higher level. Four companies were nominated for the HR Proffie and Jolanda Sappelli and her team won second prize. a.s.r.’s HR strategy is based on mobility and improving agility. By investing firmly in education and employability, by promoting management based on trust and by stimulating personal leadership, a.s.r. is able to acquire the highly skilled, agile and vital workforce that it needs to realize it’s strategic goals now and in the future. a.s.r. is the Dutch insurance company for all insurances and known for her brands a.s.r., De Amersfoortse, Ditzo, Europeesche Verzekeringen and Ardanta. With 3500 employees and a revenue of almost € 4 billion in 2017, a.s.r. is one of the largest insurers in the Netherlands. a.s.r. 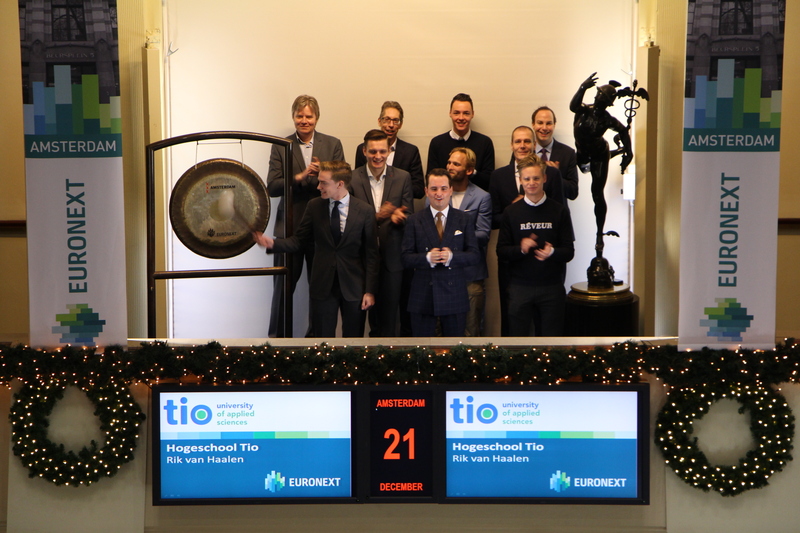 is listed on Euronext Amsterdam and included in the AEX-index. During the 7th edition of Amsterdam Light Festival, one of the artworks can be seen on Beursplein. Frédérique ter Brugge, managing director, will open the stock exchange. With the realisation of more than 200 artworks since 2012, Amsterdam Light Festival has developed into one of the largest light art festivals in Europe. In a short time, we were able to make light art known to a wider audience. Every year, artists from around the world work on a new exhibition that is made especially for Amsterdam. After their premiere in Amsterdam, a number of these artworks are included in the permanent collection that travels the world. Amsterdam Light Festival is an art festival brings light during the darkest months of the year. Numerous light artworks made especially for the festival are shown against the idyllic backdrop of the historic city centre. The festival brings creativity, innovation and technology together, thus embodying Amsterdam's core strengths. Prof. Dr Mary Pieterse-Bloem, Global Head Fixed Income ABN AMRO Private Bank, has been voted the most influential investor of 2018 by her colleagues, the readers of IEXProfs. To celebrate this success Prof Pieterse-bloem will sound the gong. 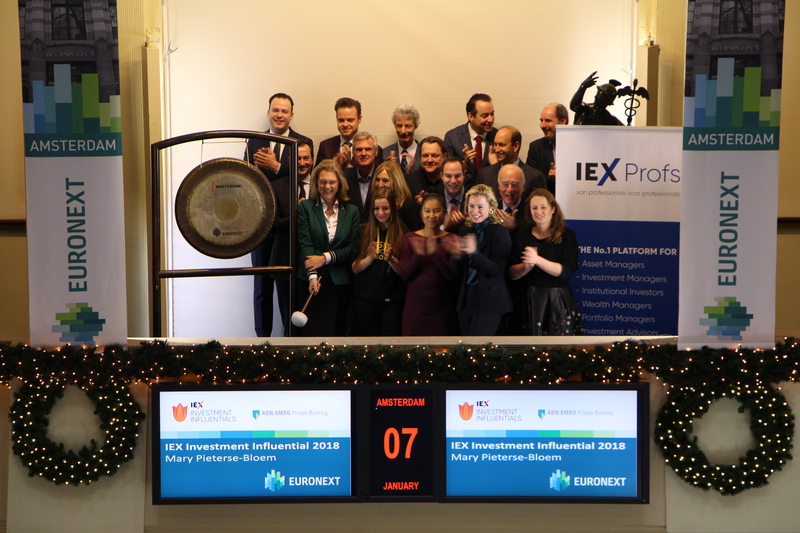 IEXProfs annually organizes the election for the IEX Investment Influential 2018 (formerly known as Dutch Investment Influential). For two weeks in November, professional investors can cast their vote online, choosing between 150 nominated colleagues. This year’s edition was extra special; the editors of IEXProfs nominated almost seven times as many women as last year. In the Dutch investment sector, five out of six executive positions are occupied by a man. This is not appropriate for the present time and needs to change. The financial industry needs more women. One way to achieve this on the platform, is to put the most important women of the sector in the spotlight. Professional investors agreed because the top 10 was full of influential women. Mary Pieterse-Bloem took the lead from the beginning of the elections and did not let go. She convincingly became the most influential investor 2018. Prof. dr. Mary Pieterse-Bloem is Global Head Fixed Income ABN AMRO Private Bank and, since 2018, also Financial Markets Professor at the Erasmus School of Economics. Besides this, she is chairman of the Rente Gilde, member of the Financial Table of Kon. Industrieele Groote Club, Member of the Advisory Board of the ESAA Certified Pension Executive program and member of the Advisory Board of IEXProfs. Royal Dutch Auping CFO Willemien Boot opened the Dutch stock exchange. On November 14th Willemien won the Huub van Rozendaal award for Best CFO of a Family business. Auping has worked for 130 years now on solutions in the area of sleep and the power of rest. Our conviction: a rested world is a better world. It is their mission to work with passion and curiosity to provide products and services that ensure you can live your well life well rested and relaxed, energetic, alert and pleasant. Sustainability, design, and innovation are their main drivers. Auping is the developer, producer and retailer of personal sleep and rest solutions with attention for people, the environment and the future. May all your days be circusdays! Successor of Tony Wilson and new ringmaster of the Worldchristmascircus Fred Butter will ring the bell. The Worldchristmascircus or ‘Wereldkerstcircus’ in Dutch has brought happiness to literally millions of people from all around the world in its 34 year history. The history of their winter venue, the Royal Theatre Carré here in Amsterdam, is equally impressive: over 130 years this has been the ultimate circus venue in Europe. The Worldchristmascircus is world-renowned for its elaborate costumes, the incredible historical setting and the extremely high quality of the acts. Only the winners of the most prestigious prizes in the performance world are welcome in the arena. This year however, they are going even more overboard for the ultimate circus celebration: 250 years of circus! The Wereldkerstcircus B.V. is a special collaboration between Stichting Carré Theatreproductions, Stardust Circus International B.V. and Interpresario, just for this Christmas production. 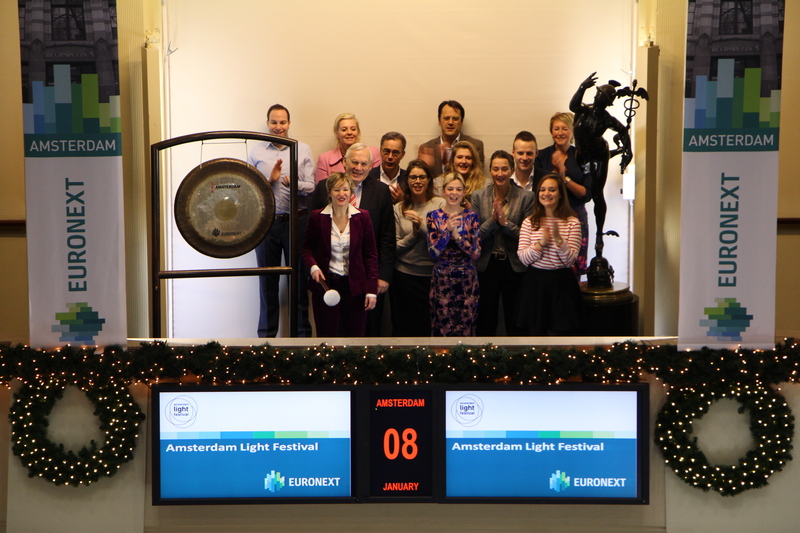 Triodos Fair Share Fund, one of Triodos Investment Management’s impact investing funds, will be listed at Euronext Amsterdam as per the 1st of January 2019. Up until that moment, the fund is available exclusively through Triodos Bank Netherlands. With this listing the fund will also become available to investors who do not hold an investment account at Triodos Bank. To celebrate this Tim Crijns, Fund Manager of Triodos Fair Share Fund, will be sounding the gong. Triodos Fair Share Fund invests in microfinance. Since inception the fund has grown to a volume of EUR 350 million, allowing it to provide finance to around 100 microfinance institutions and banks in 40 countries in Afrika, Asia, Latin America and Eastern Europe. These institutions provide services to people on low incomes and small and medium sized enterprises who have no or limited access to financial services. DoubleDividend is delighted to continue the tradition to ring out an investment year together with Stichting Run4Schools. DoubleDividend likes to draw attention to the runners of Stichting Run4Schools. On April 20, 2019, they will run the 56 tough kilometers of the Two Oceans Marathon in Cape Town, South Africa for this charity. DoubleDividend bridges financial and social return and fully supports the mission of Stichting Run4Schools. The team of DoubleDividend is composed of a few fanatical runners who frequently run to support charity. “Run4Schools is a beautiful initiative for young South African children. By organizing both in - and after - school sports activities these kids are of the streets and work on a better future. This is financed by the runners for this charity. Today, we are pleased to make these runners more visible with the sound of the gong”, says Marian Hogeslag, partner at DoubleDividend. DoubleDividend Management B.V. specializes in the field of sustainable investments. DoubleDividend is a manager of investment funds and offers tailor made asset management services. DoubleDividend invests on the basis of the conviction that sustainability positively contributes to the risk- return profile of an investment portfolio. DoubleDividend Management B.V. has a licence under the Dutch Financial Supervision Act and is a partnership with extensive investment experience. Run4Schools finances and organizes both in - and after - school sports activities and care at three primary schools and one high school in the township of Mitchell's Plain, Cape Town, South Africa. In cooperation with The Western Cape Education Department. Over 5.000 children are participating in our programs on a weekly basis. Different kinds of fundraising activities are initiated around running events in The Netherlands and also in South Africa. Our programs are financed with these funds. December is the month to celebrate! But unfortunately also a period that comes along with a lot of accidents that can easily be prevented. On behalf of Brandweer Amsterdam-Amstelland commander Leen Schaap sounds the gong and whishes everyone a safe 2019. Traditionally on January 1st the Unox New Year’s dive takes place on 130 different locations in the Netherlands. This year they celebrate the 60th edition of the New Year’s Dive and the 50th time in Scheveningen. To celebrate this Sietse Busser sounds the gong. Over 50.000 people will start the New Year with a fresh dive in the water. 10.000 people will start in Scheveningen and for each diver Unox will donate 1 euro to the food bank. From 21 to 30 december, the RAI Amsterdam will be transformed into ‘Het Amsterdamse Winterparadijs’. A magical winter wonderland for all ages to enjoy for hours. Visitors can go ice-skating, cross-country skiing, curling, enjoy the apres ski bars and a variety of Dutch singers. 4PM Entertainment was founded 13 years ago by Philippe Hes and Mitchel Bovenlander. Other well-known concepts are Kingsland Festival, FRIS events and the Helden van Oranje. 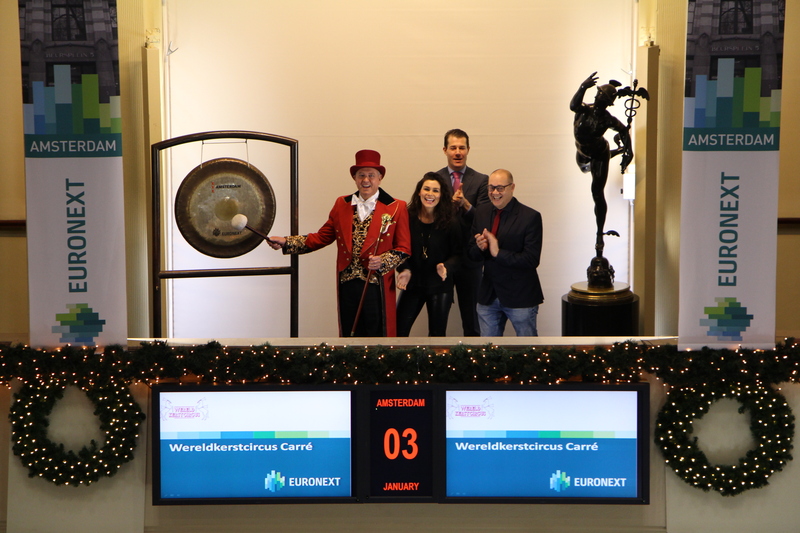 Predilife lists on Euronext Growth on December 21st, 2018. Predilife specializes in the development of predictive tests, particularly in the field of oncology. The company has MammoRisk, a breast cancer predictive test that uses a first mammogram and a few questions to obtain a first risk assessment. A genetic test then makes it possible to estimate the risk of breast cancer more accurately. The technology used by MammoRisk makes it possible to evaluate, from a database of individuals monitored over time, the risks of an individual compared to the future of his « closest » neighbours thanks to a database of 1,000,000 American women and 350,000 French women. Student of International Business Management (IBM) Rik van Haalen ‘’earned’’ 30 million dollars during his studies at Tio University of Applied Sciences. Unfortunately, it is not a real profit: as part of a project he participated in a virtual stock exchange game. To celebrate this success he will be sounding the gong. 11 weeks preceded the final, in which the third-year IBM students had to work like real stock market traders in the stock exchange game. Including the use of forex, options, short selling and margin trading. The most important thing the students learn from this project is understanding how financial news and financial decisions can influence the global economy and thus the stock market. Tio University of Applied Sciences is a private university of applied sciences that offers higher vocational and intermediate vocational education in the areas of hotel, events, tourism, marketing and business. The studies have been leading for years in various rankings such as the Keuzegids (Higher Education Guide). Max Bronzwaer, former Treasurer of Obvion, opens the trading at the Amsterdam exchange today. 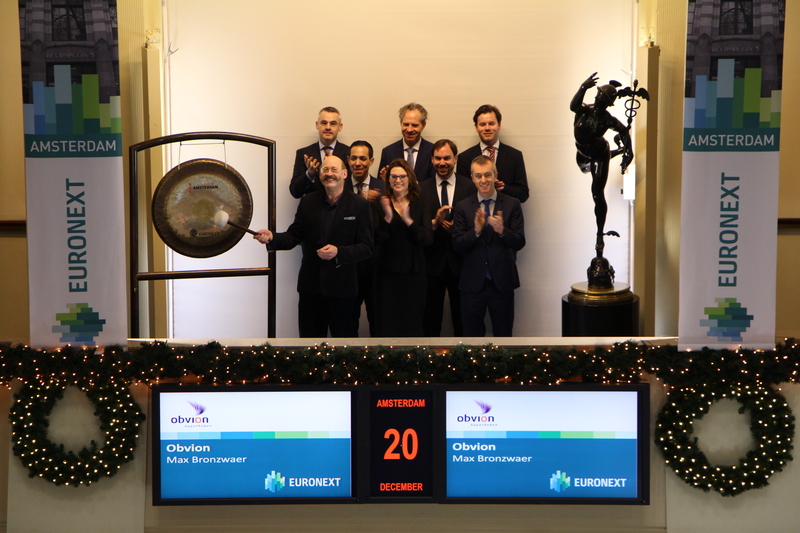 With the closing of STRONG 2018-1 Obvion has issued today its 48th RMBS bond, all these bonds have been listed on Euronext Amsterdam. is an established originator and servicer of Dutch residential mortgages and active in the mortgage business since 2002. Obvion provides responsible funding (solutions) for the housing needs of the customer based on a strong relationship with the customer and in close cooperation with its intermediaries. Obvion strives to be an agile and externally oriented organisation. Customer focus is key in their strategy. Their philosophy is to be empathic, open and passionate and they aim for continuity for their customers and other stakeholders by providing responsible financing solutions. Sisco Sapena, CEO of Lleida.net, opens the trading day in Paris. Lleida.Net is the leading Spanish operator in electronic communication certification and econtracting. The group provides solutions and services for certification and securing of e-mail, SMS and electronic documents to the general public, businesses and public administrations. Lars Verpalen, Program manager Sustainable Mobility at Enexis Group, opens trade to celebrate winning the Sustainable Business Challenge 2018.
is organized by SustainableMotion for the sixth time. During the challenge 100 young talents work on business cases of companies that want to become more sustainable. With its methods SustainableMotion empowers young talents to transform their ambition and knowledge into innovative ideas and solutions. one of the biggest grid operators of the Netherlands, participates in the challenge to get fresh insights. As a mixed investment company Enexis Group has an important social role in acceleration of the energy transition, which is in line with the goals of the Sustainable Business Challenge. In Dutch football there are tens of thousands of games every week. The traffic that goes with it (players, supporters and family members) causes a huge amount of pollution: 65 kiloton of CO₂ emissions per year. KNVB and ENGIE are tackling the challenge of achieving CO₂ reduction across all kinds of transport, such as bus, car and train. Various solutions will be developed jointly in the coming years. Such as optimizing the playing schedule, integrating new modes of transport, implementation of smart charging stations and designing technical solutions for, for example, 'driving to the games together'. Football is the largest sport in the Netherlands which means that an optimal impact can be generated on CO₂ reduction. ENGIE stands out with regards to the energy transition of almost all its competitors. Because it is both a technical service provider and an energy supplier, the company can mean just a bit more for its customers. With smart technological solutions, the company looks at whether it can reduce the energy needs of its customers. Then it fills in the remaining energy requirement with renewable energy. ENGIE accelerates the transition with this two-step model.